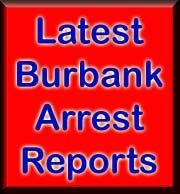 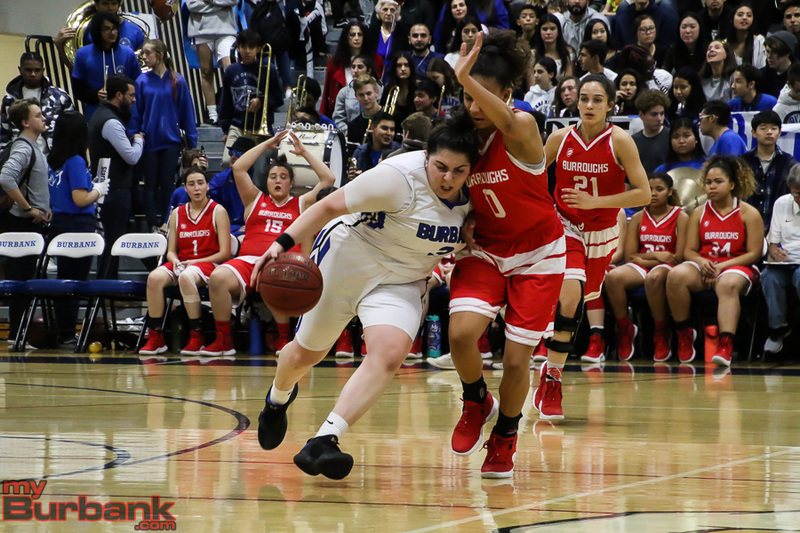 The Burroughs High girls’ basketball team knew something had to change at halftime. 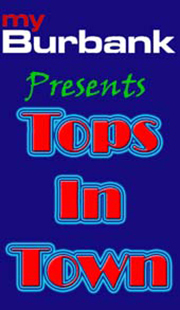 Luckily for the Indians, it did and in a big way. 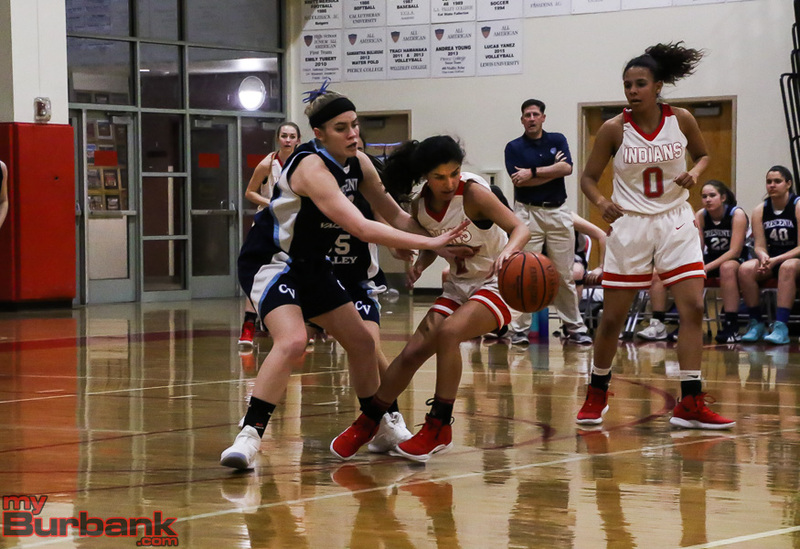 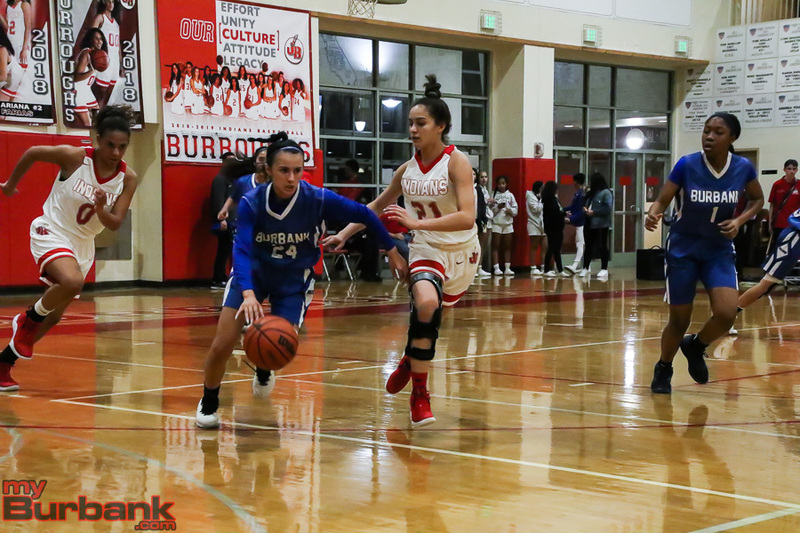 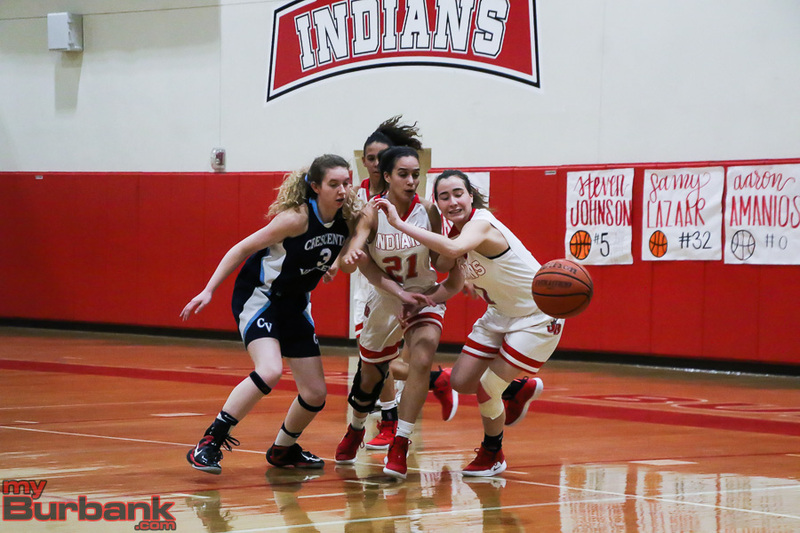 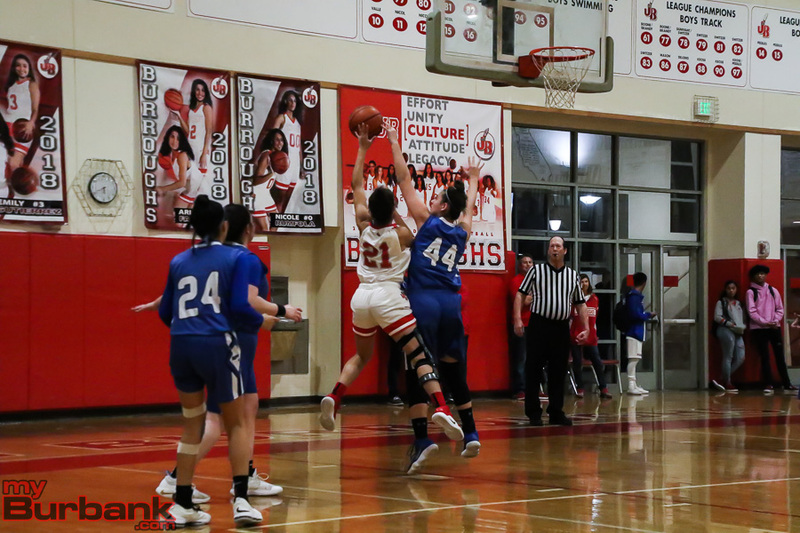 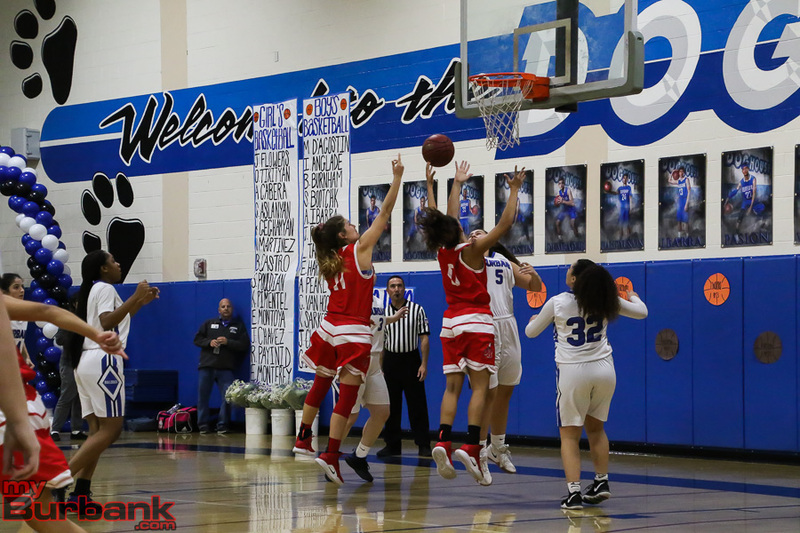 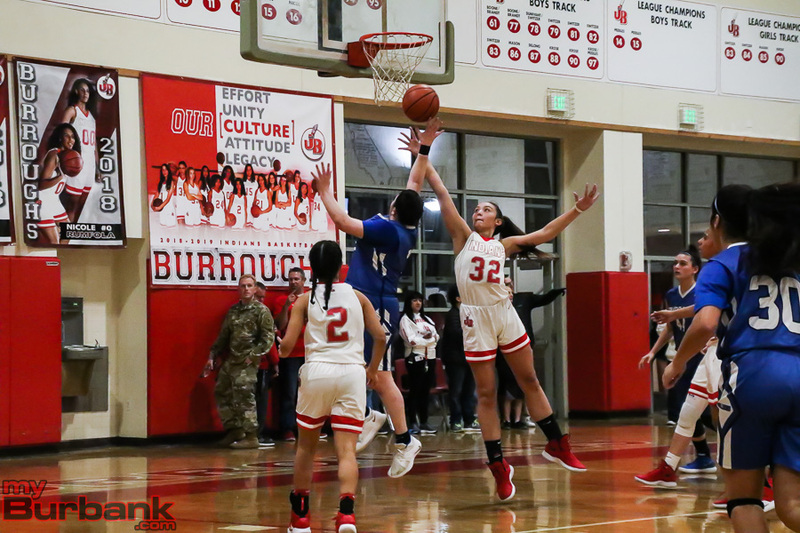 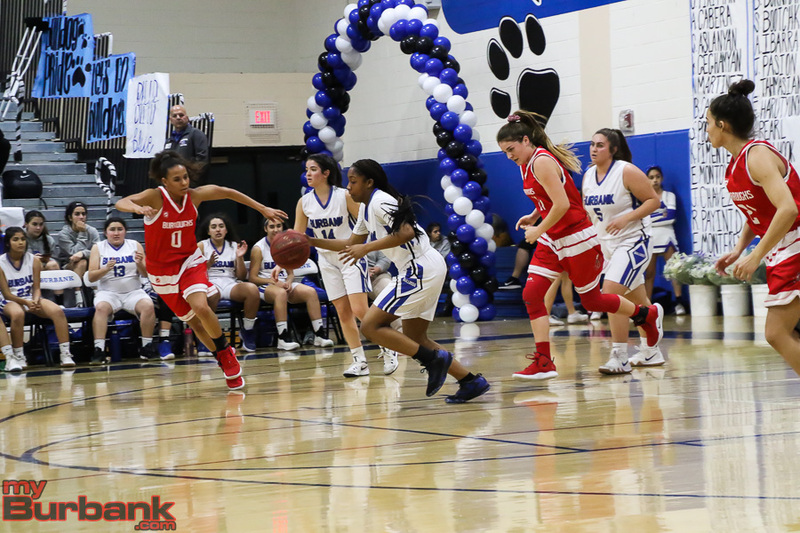 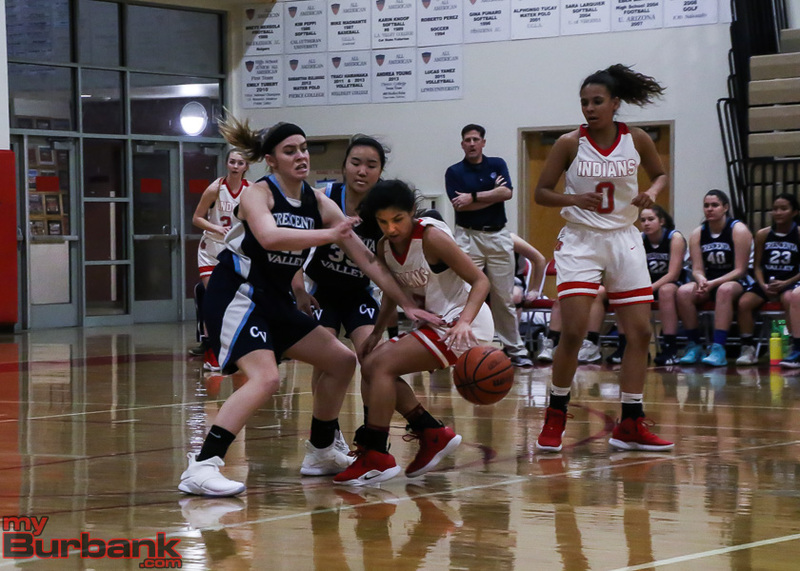 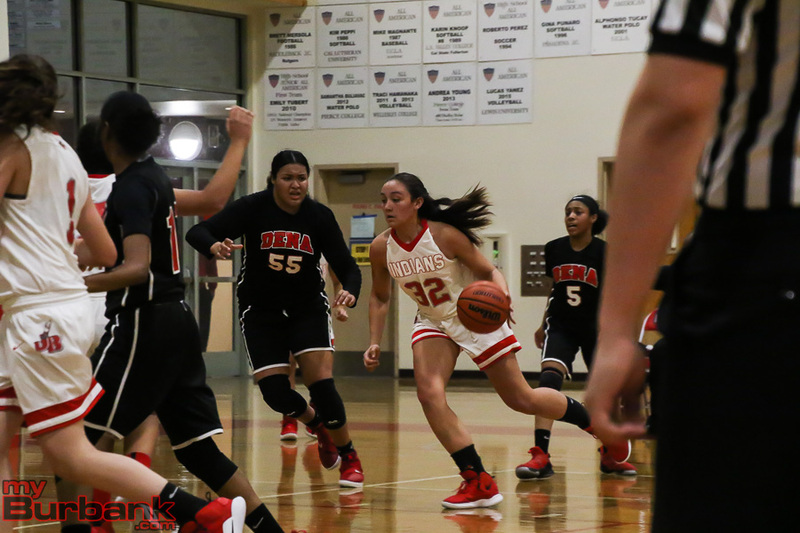 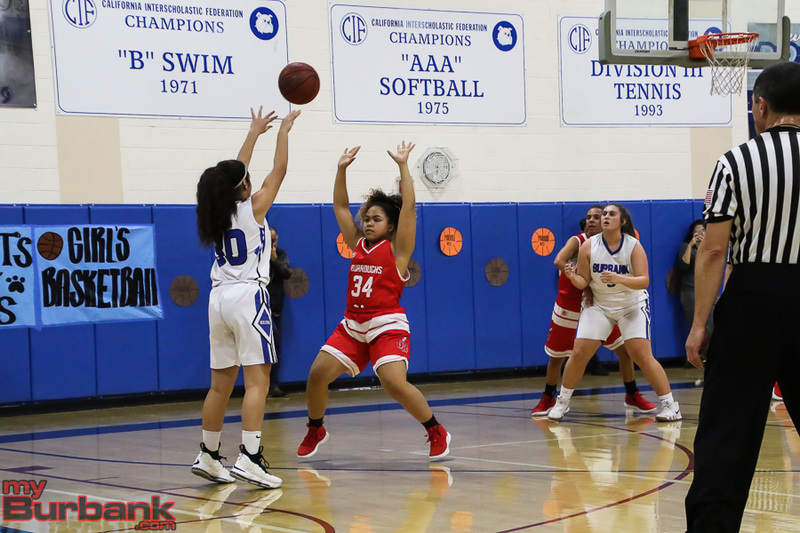 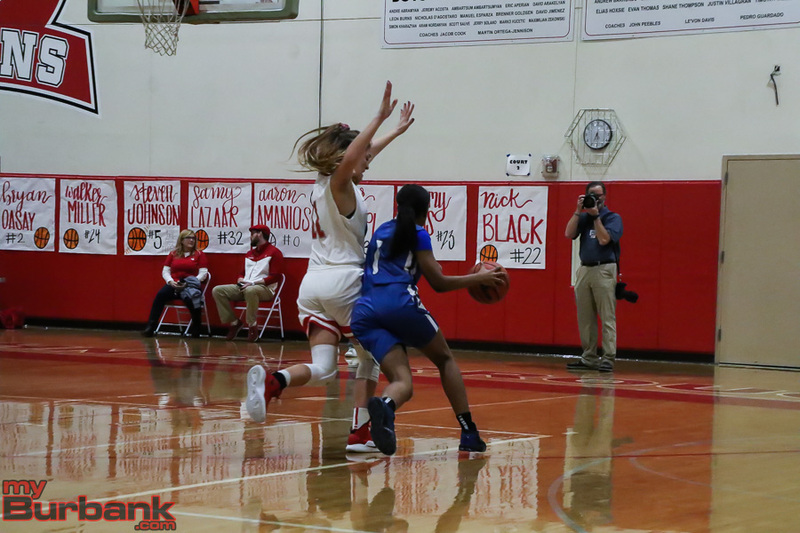 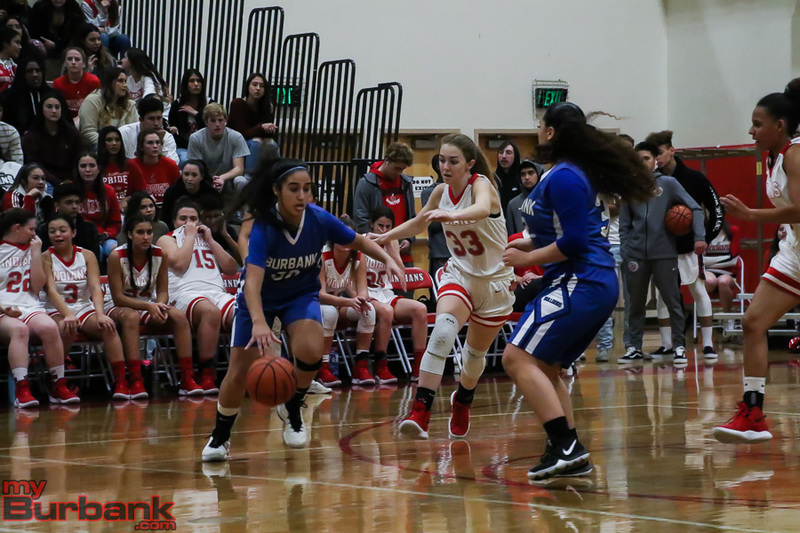 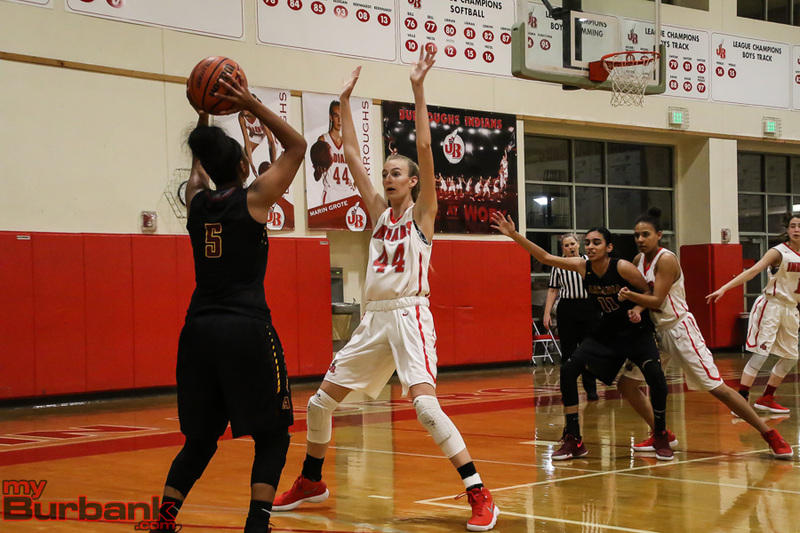 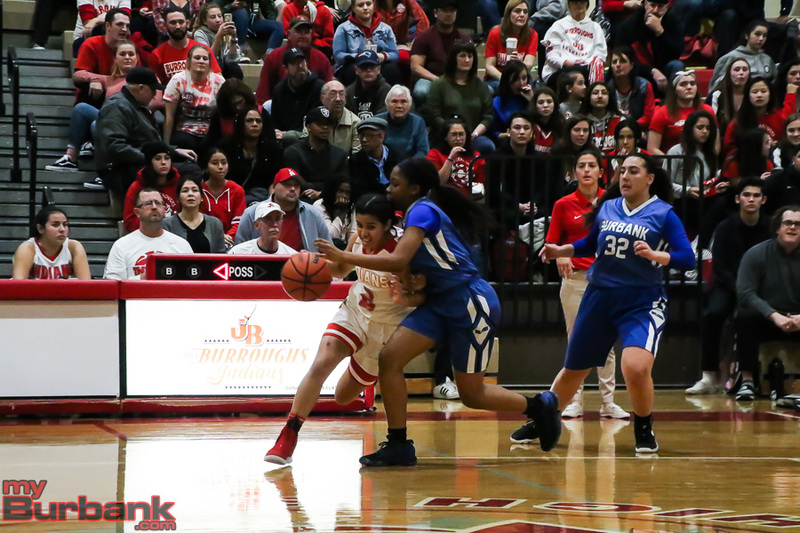 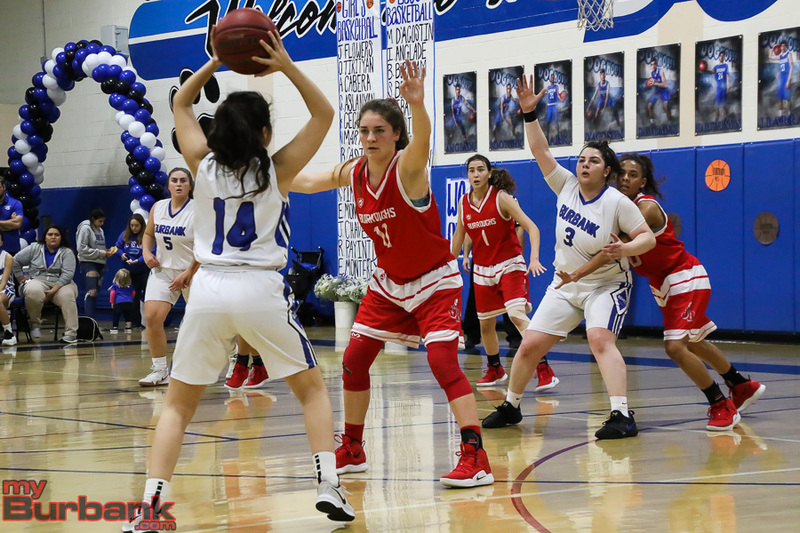 Burroughs put together a strong second-half effort on the defensive end in holding off visiting Arcadia 44-38 in a Pacific League contest Tuesday. 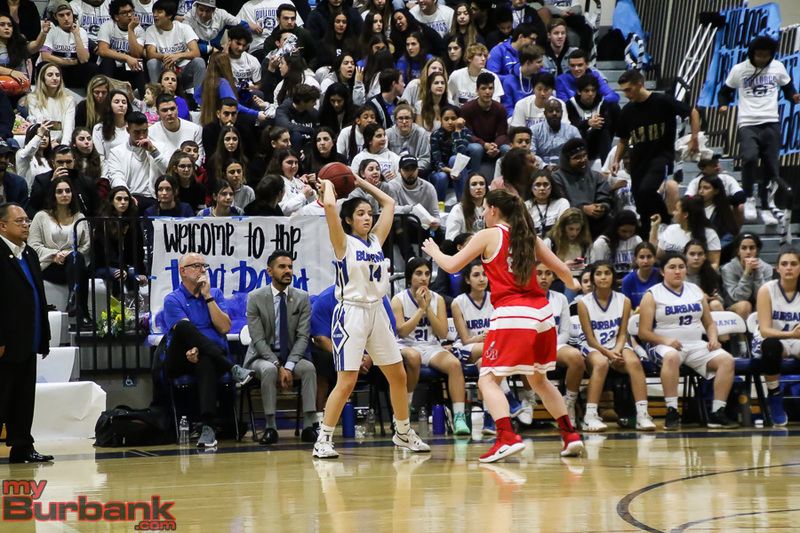 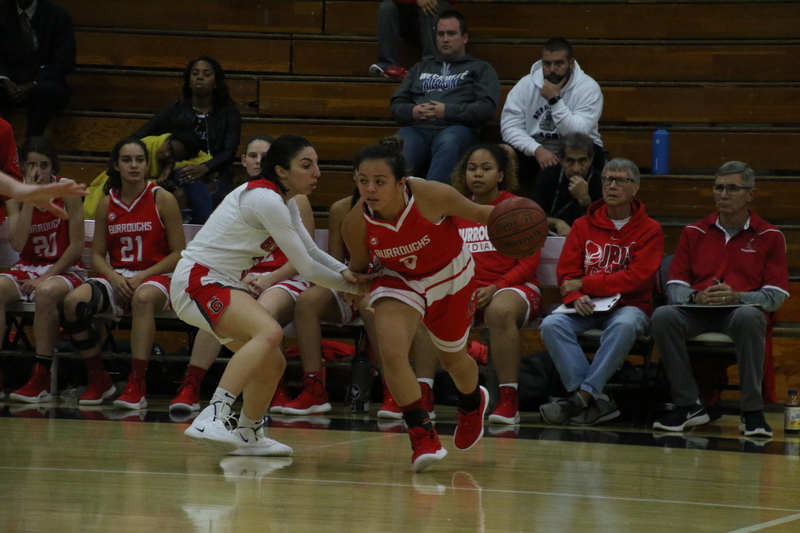 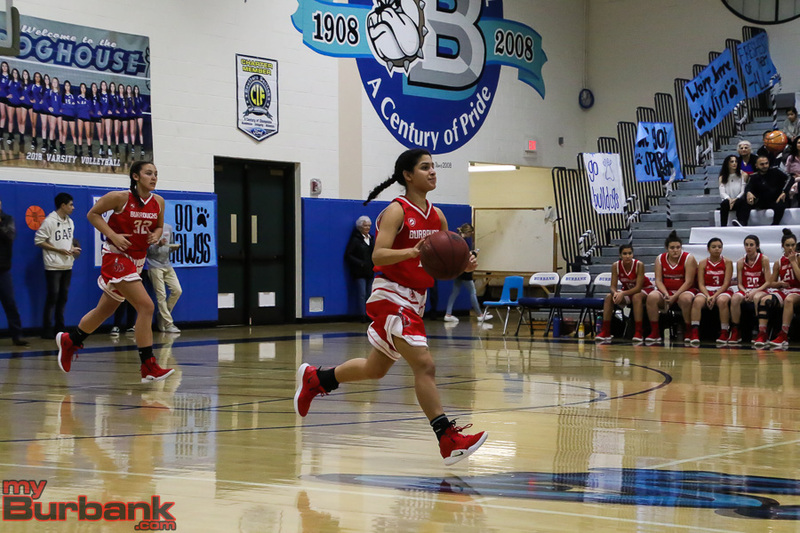 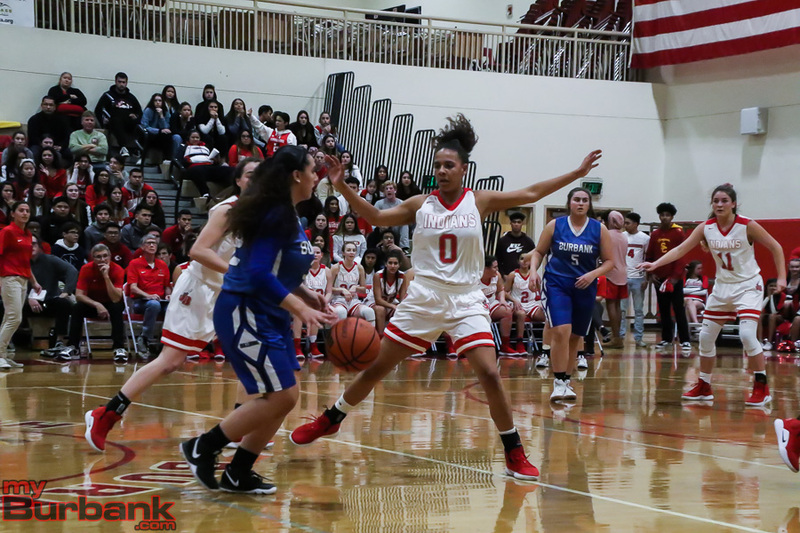 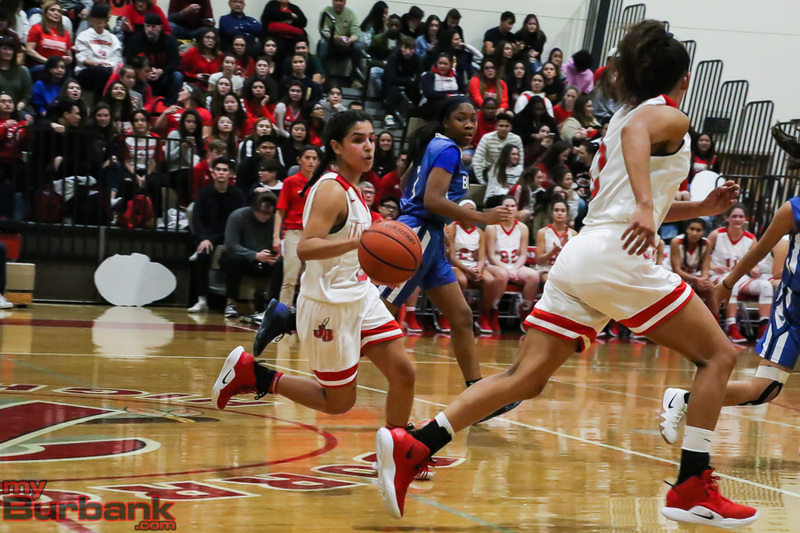 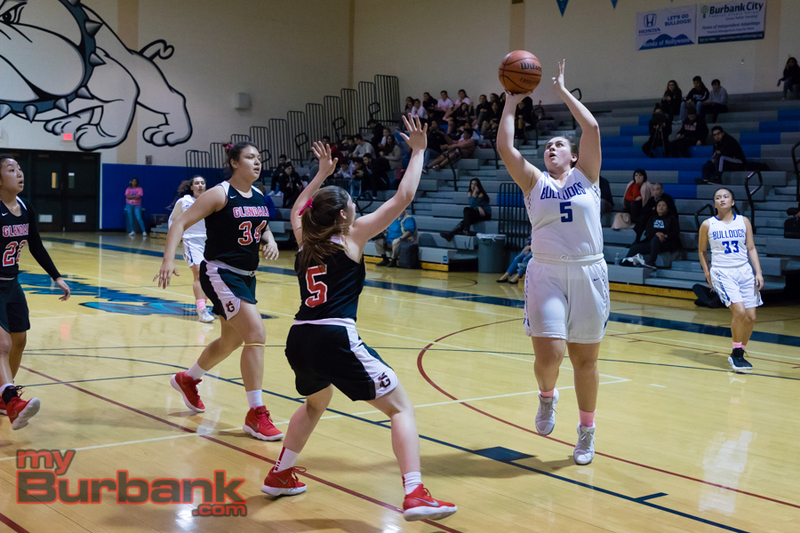 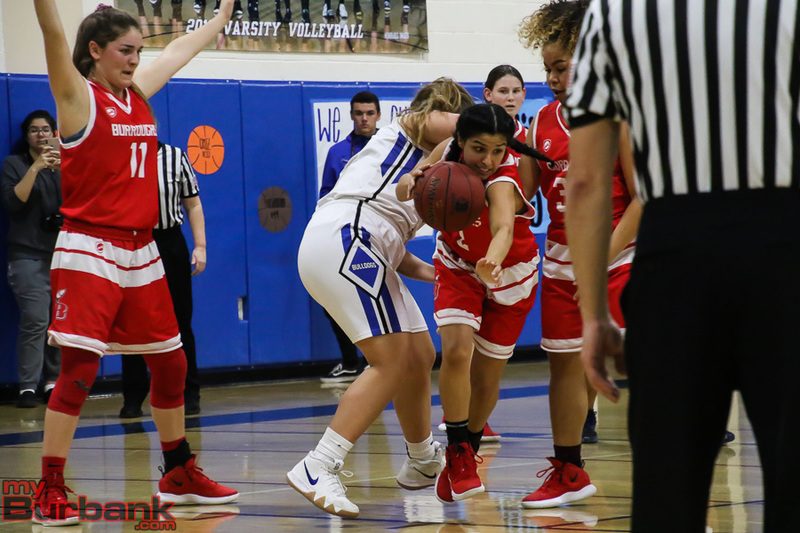 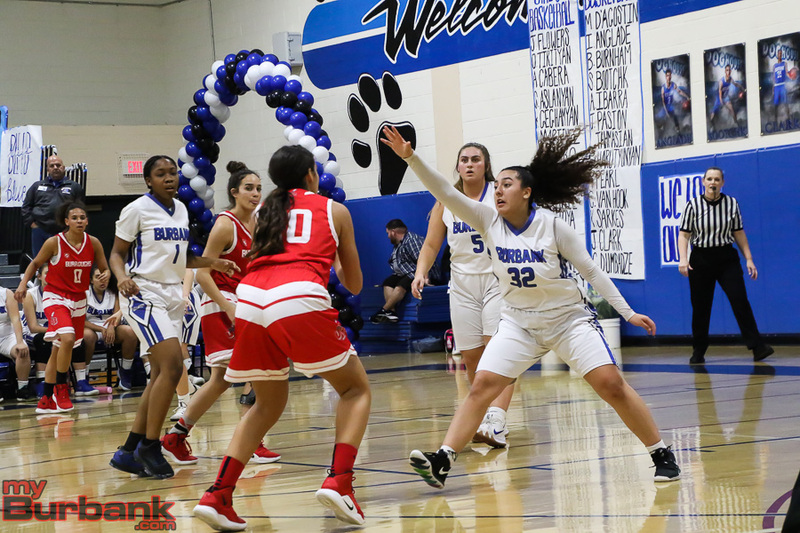 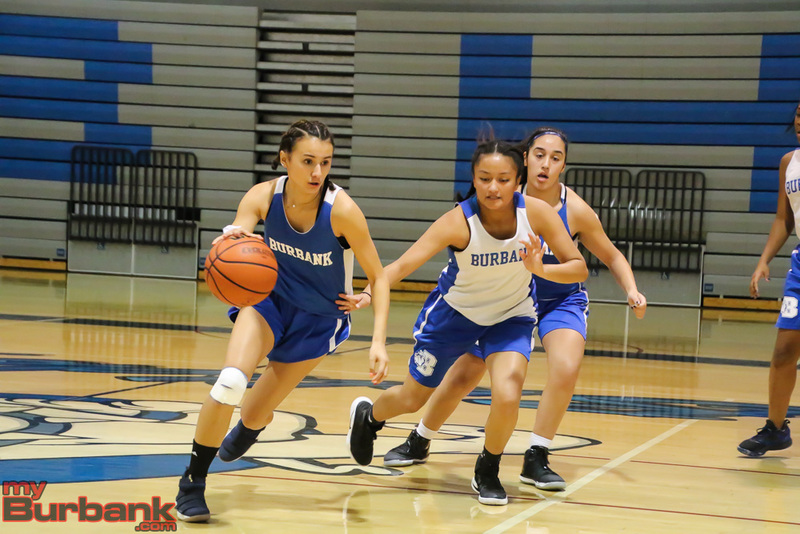 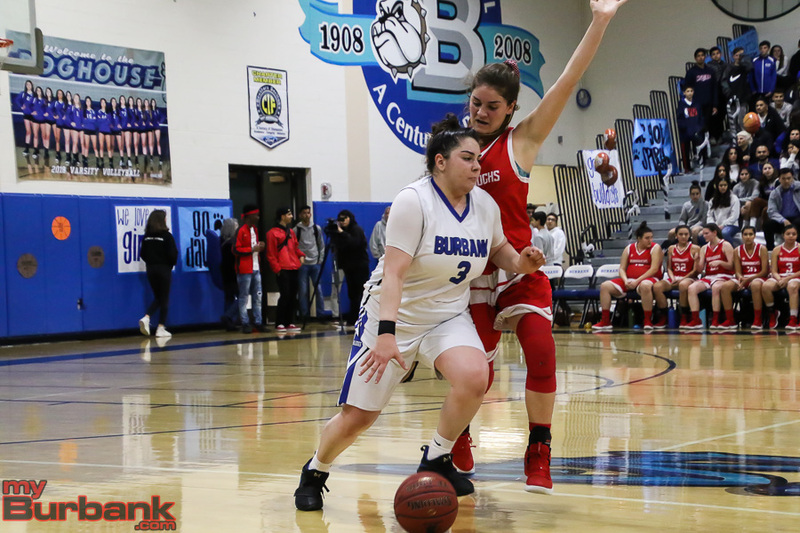 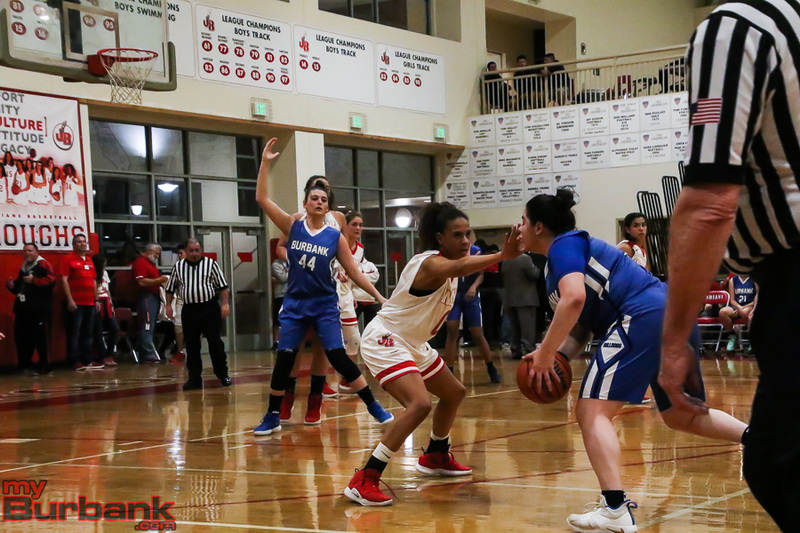 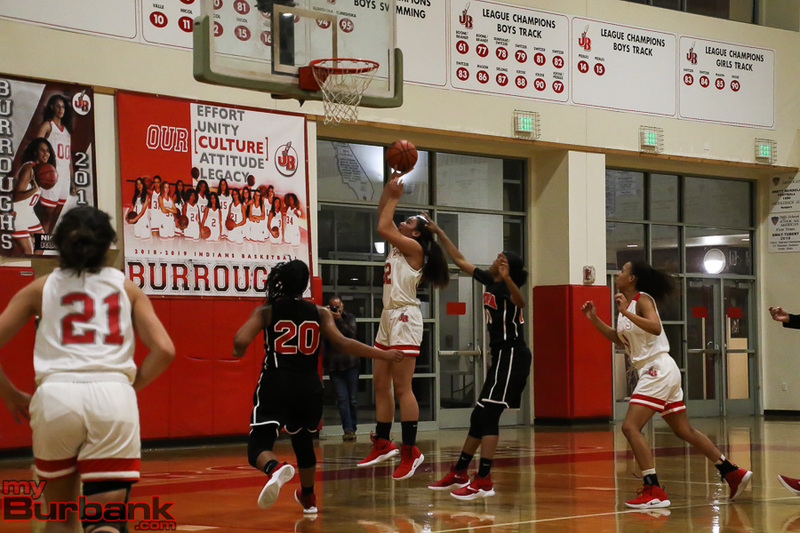 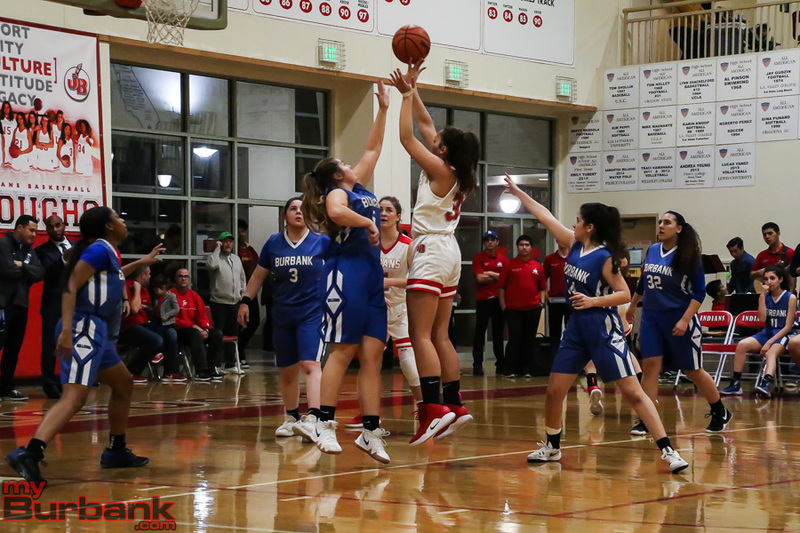 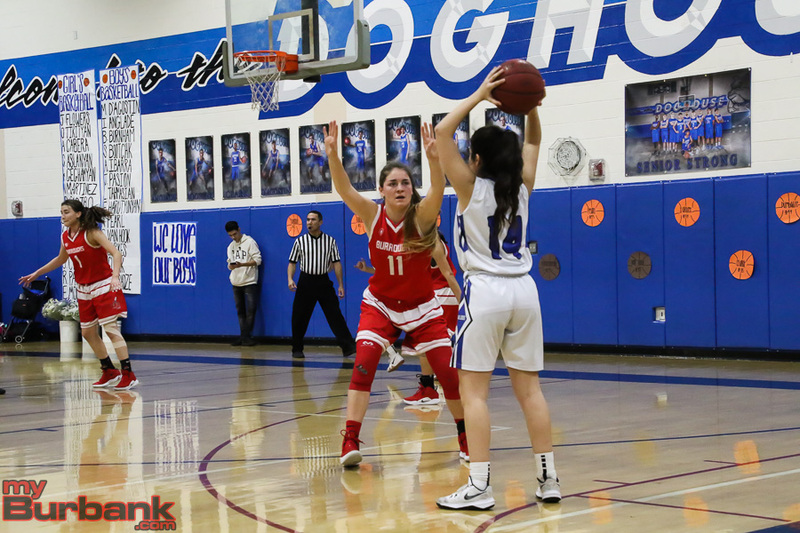 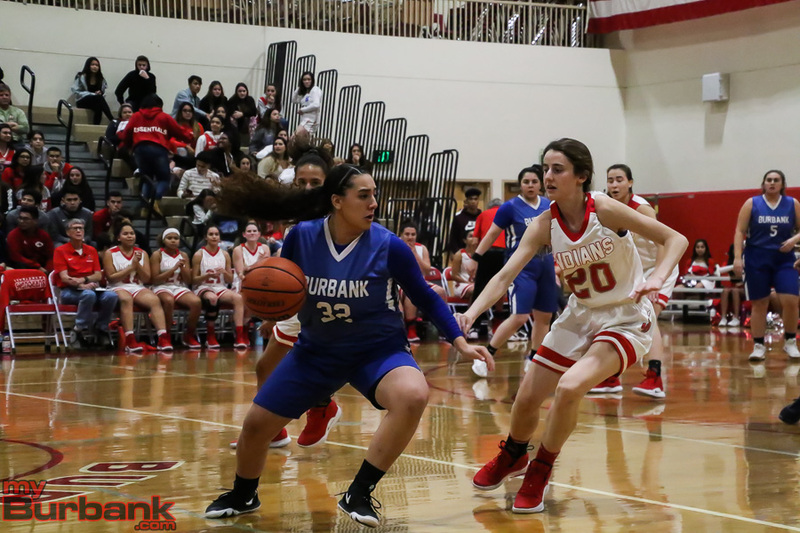 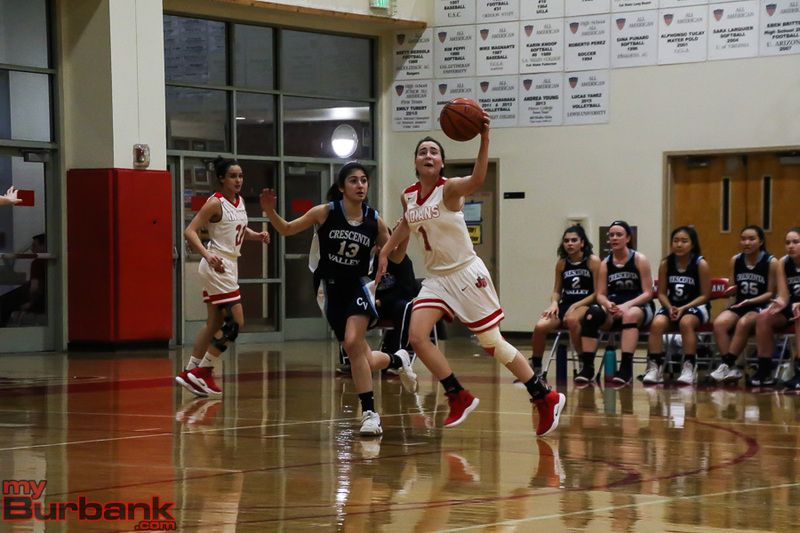 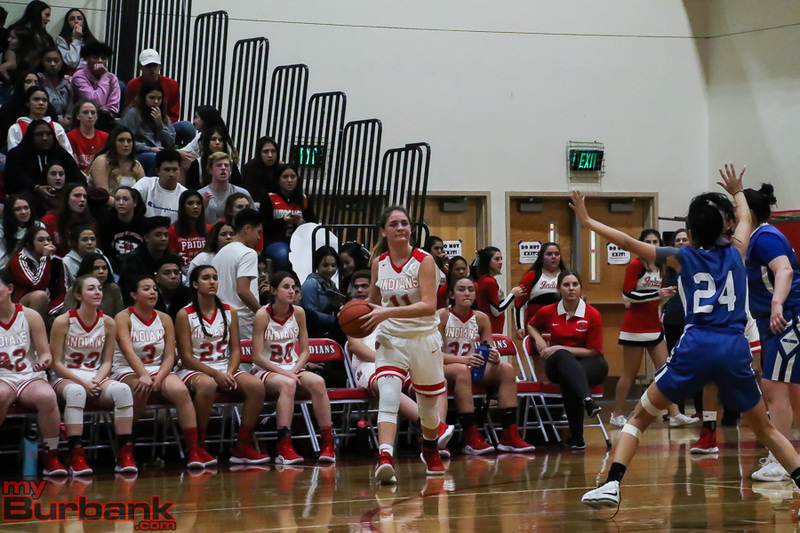 Burroughs (14-8 overall, 5-3 in the league) jumped out to a 15-10 lead at the end of the first quarter led by a pair of three-pointers from Ariana Farias. 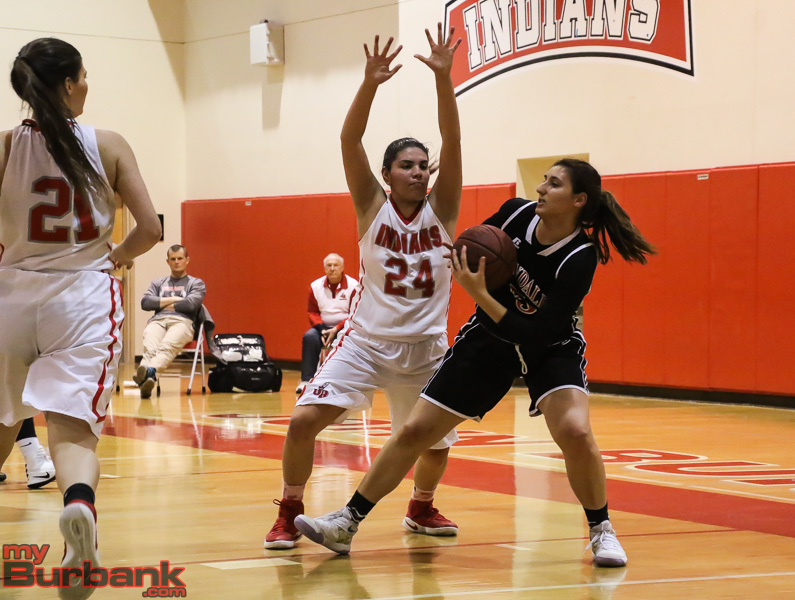 But the Indians struggled in the second quarter, lost the lead and trailed 26-22 at halftime. 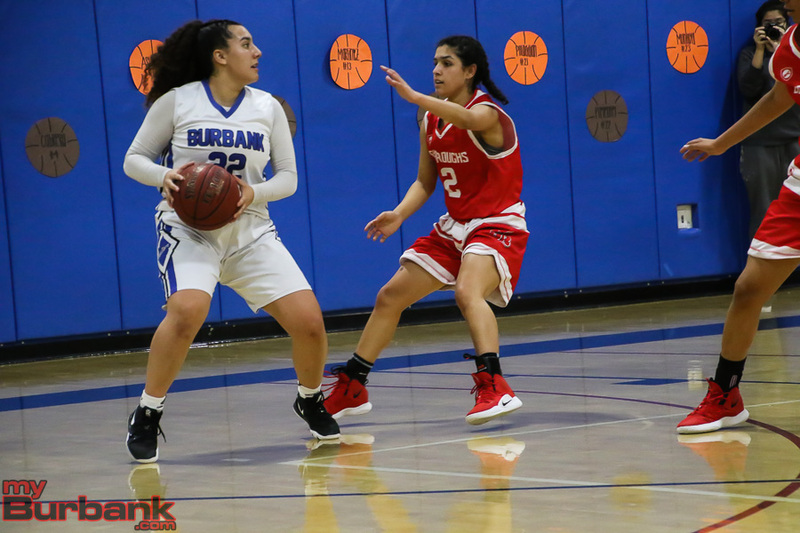 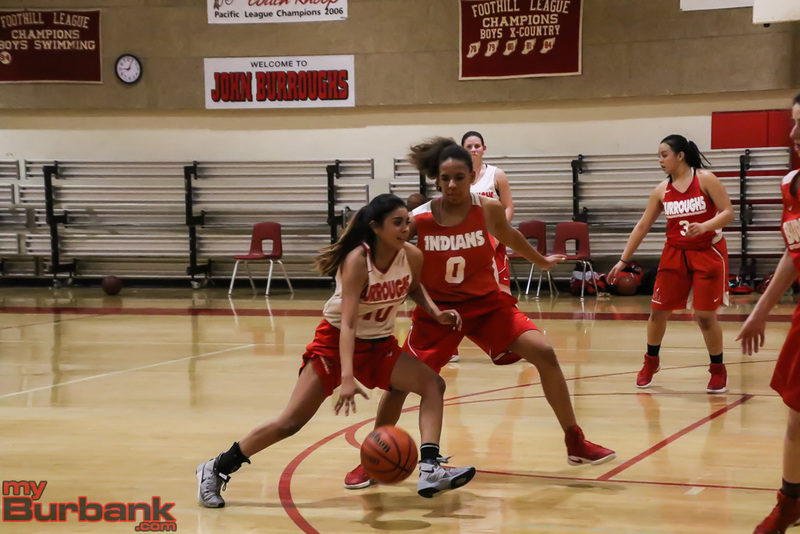 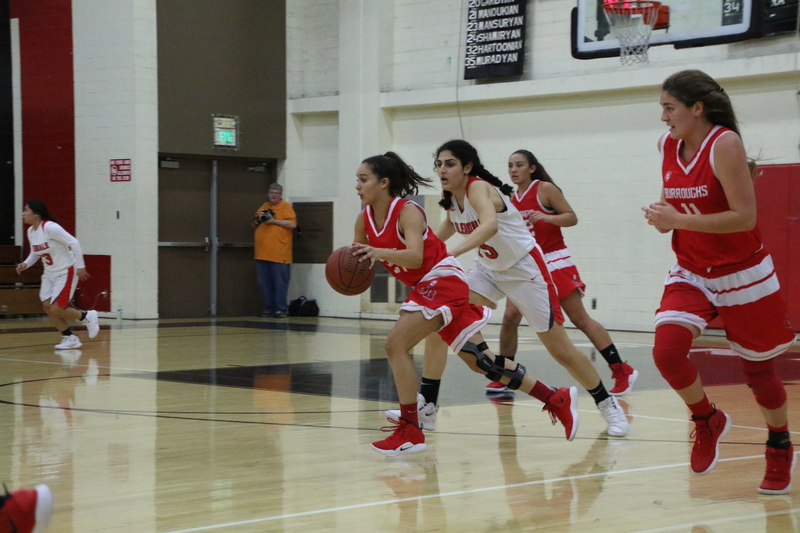 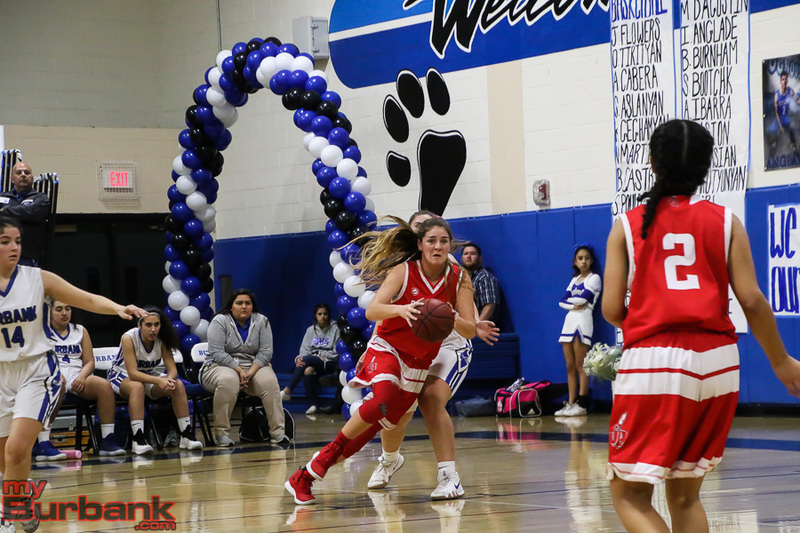 Burroughs’ comeback was helped by the play of freshman Faith Boulanger. 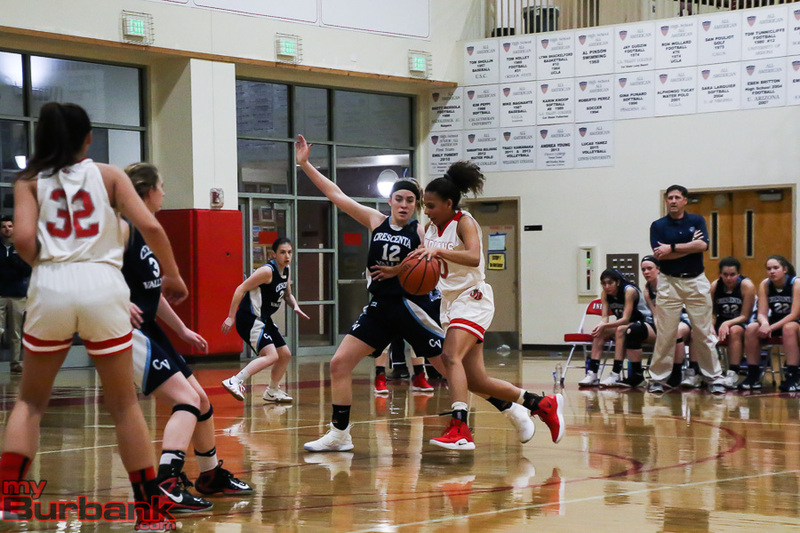 She scored six of her team-high 12 points in the third quarter. 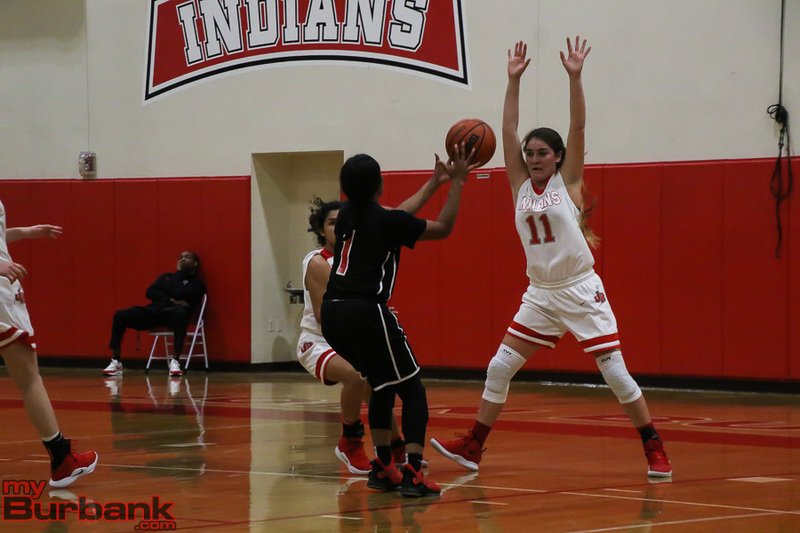 The Indians still trailed, 32-30, going into the fourth quarter when the defensive effort significantly changed. 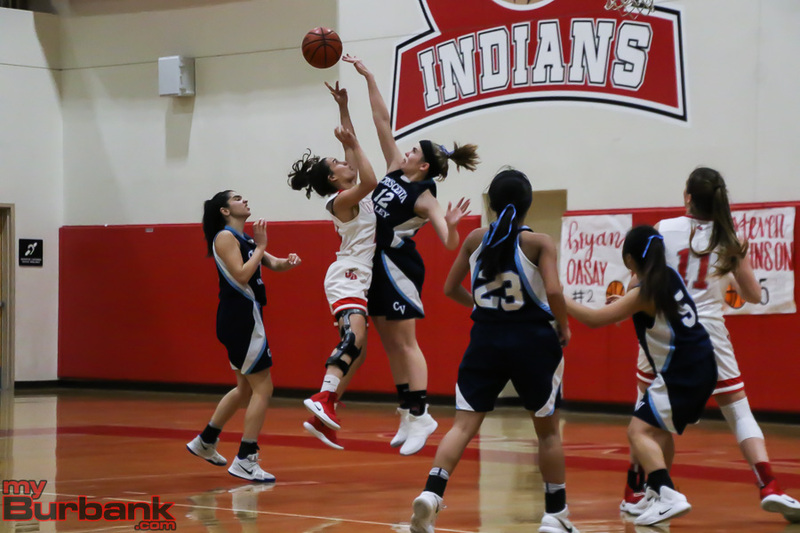 “We pretty much held them to one shot,” Oganyan said. 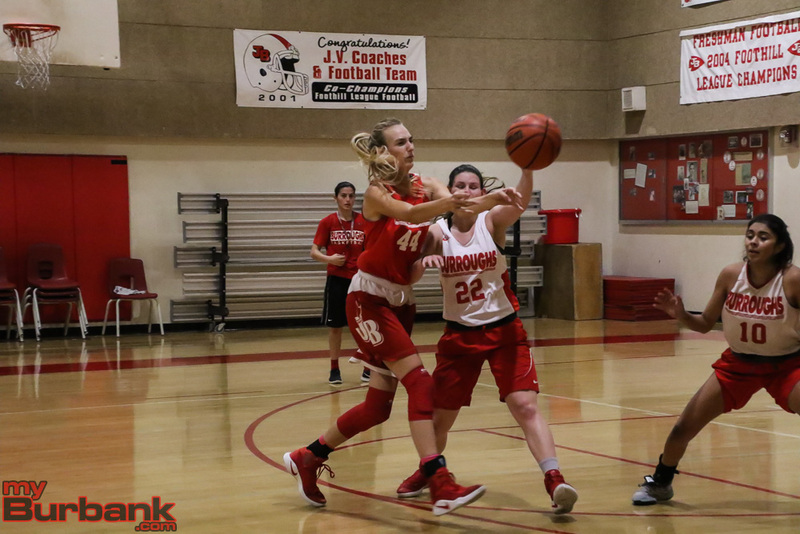 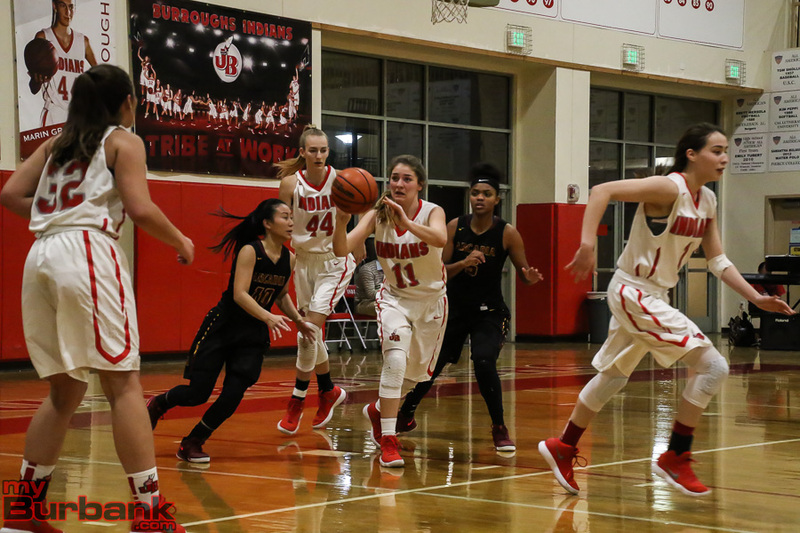 Burroughs went on a 10-0 run to start the fourth quarter, getting superb efforts from Marin Grote, Nicole Rumfola, and Jill Kukawski. 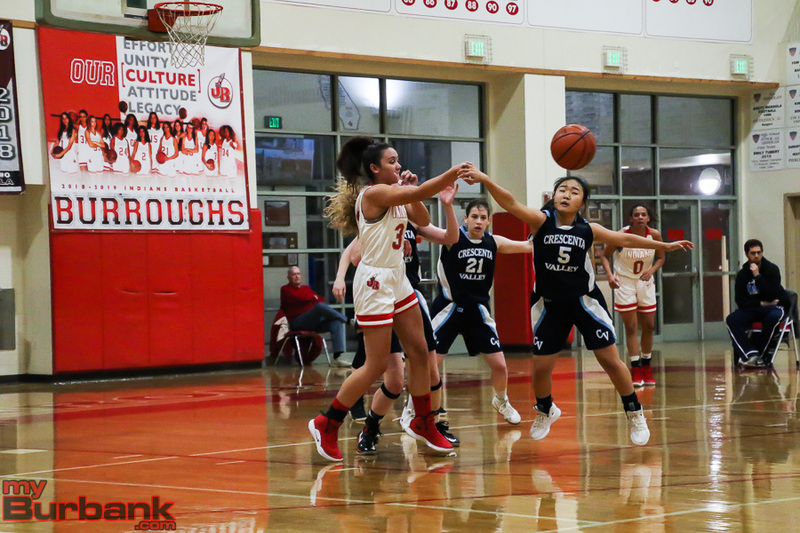 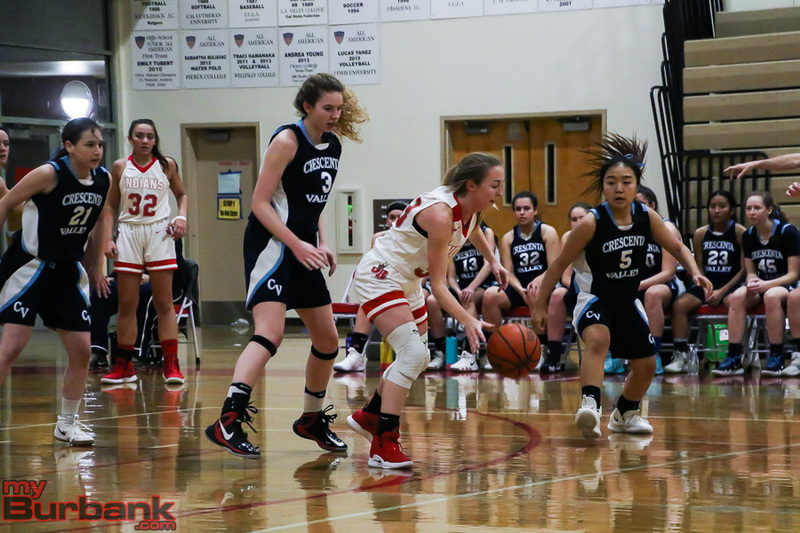 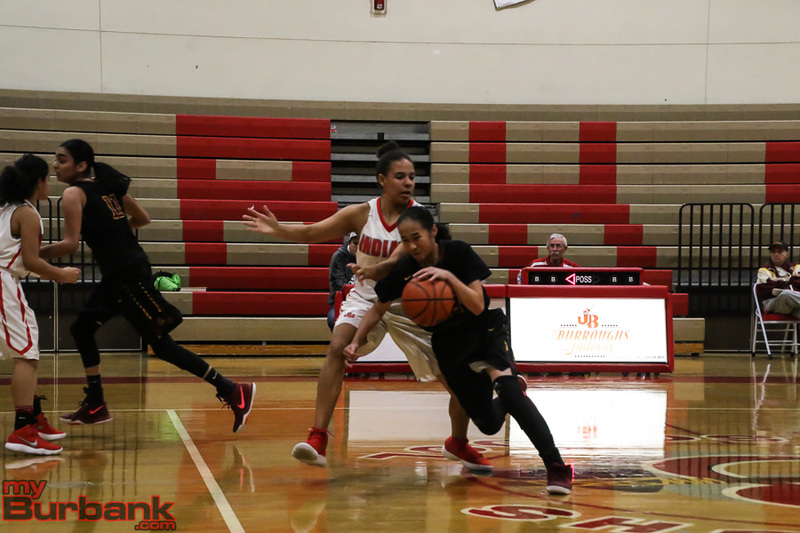 Arcadia (8-10 overall, 2-6 in the league) didn’t score its first points of the fourth quarter until just 1:44 remained in the contest when Annie Tran threw a run in the jumper. 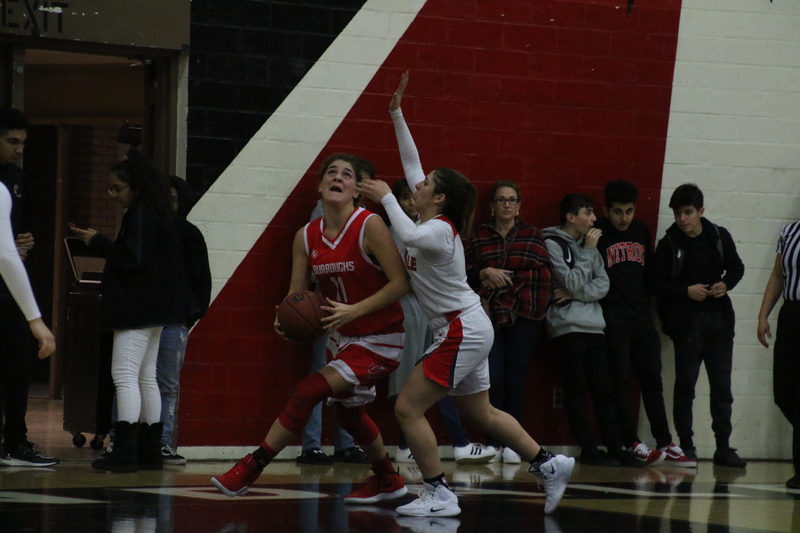 The Apaches cut the lead to 40-36 with 36 seconds to play. 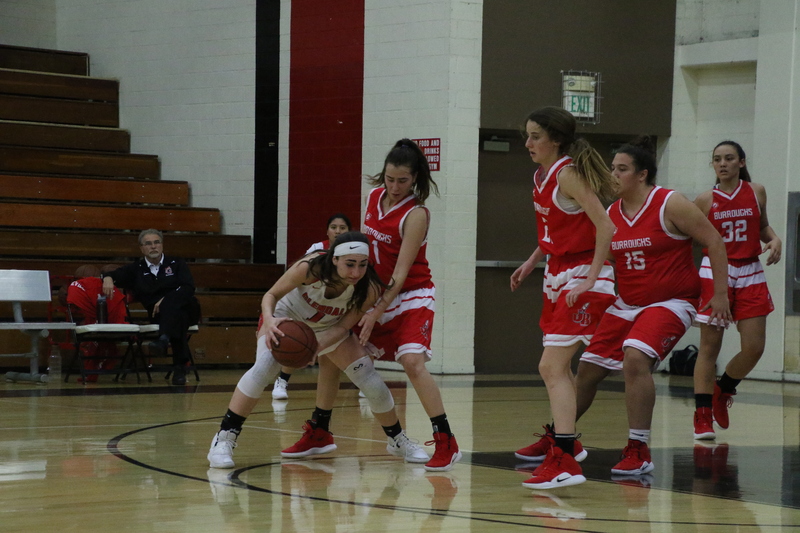 But Burroughs was tough at the free-throw line as Rumfola and Kukawski each sank a pair of free throws to keep things from getting interesting. 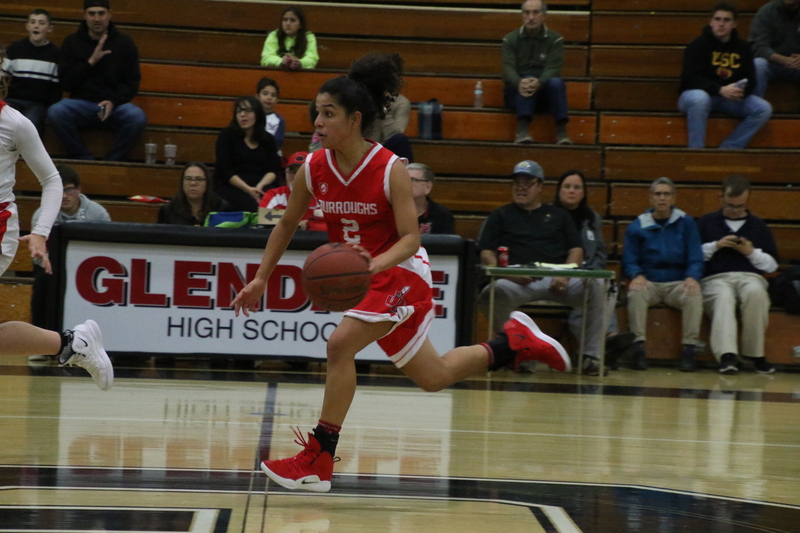 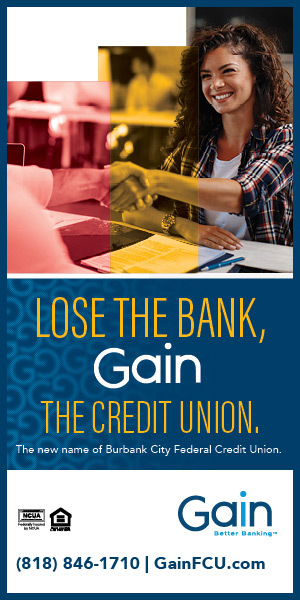 Grote finished with nine points for Burroughs. 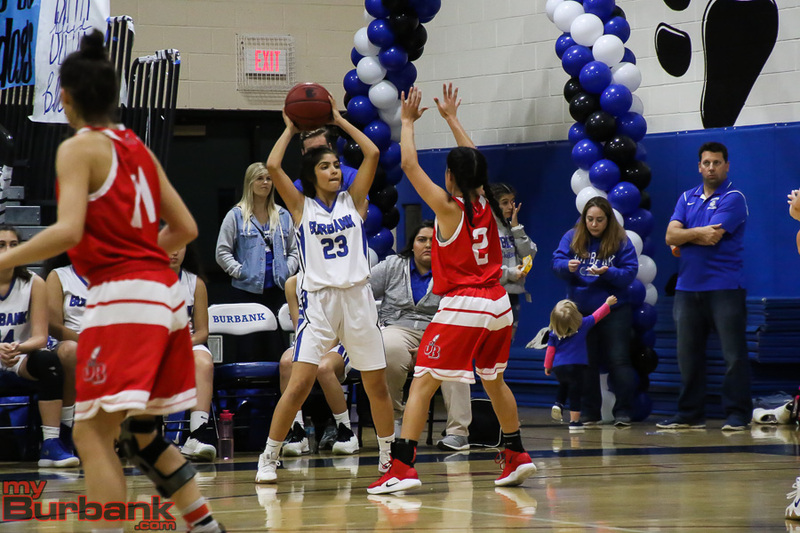 Kukawski had seven points, Rumfola and Farias each had six points. 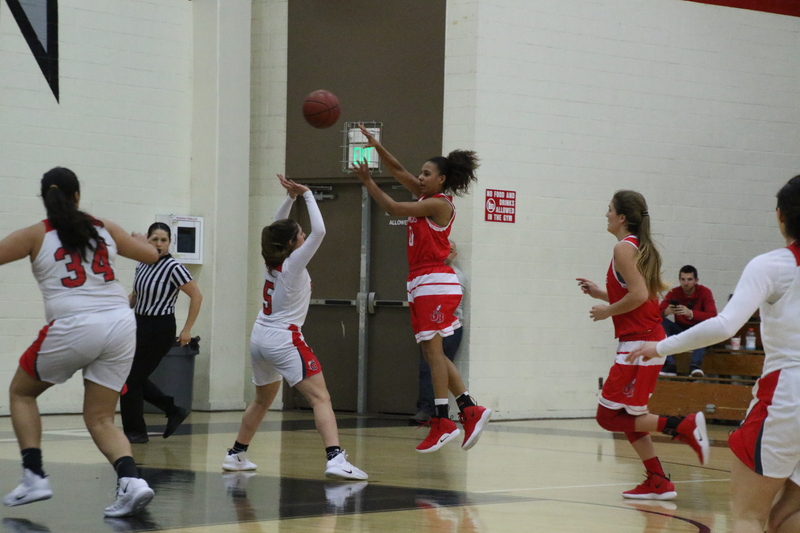 Kayla Wrobel and A’sia Morales each had two points. 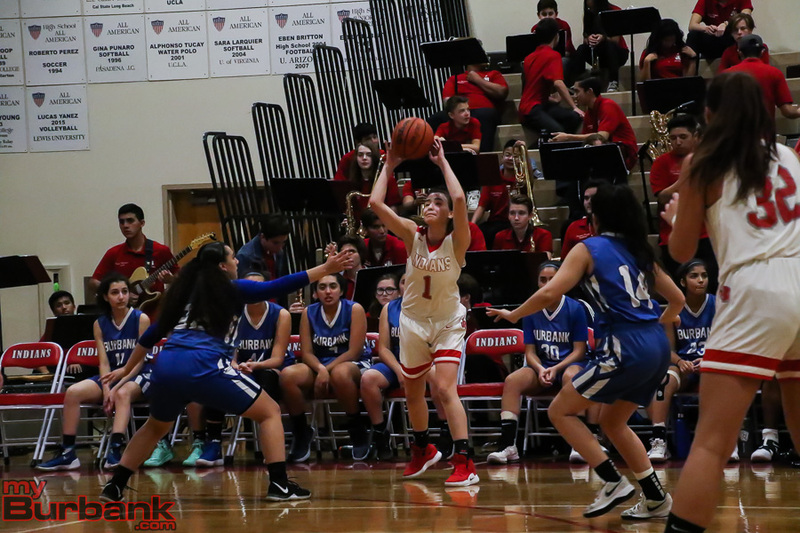 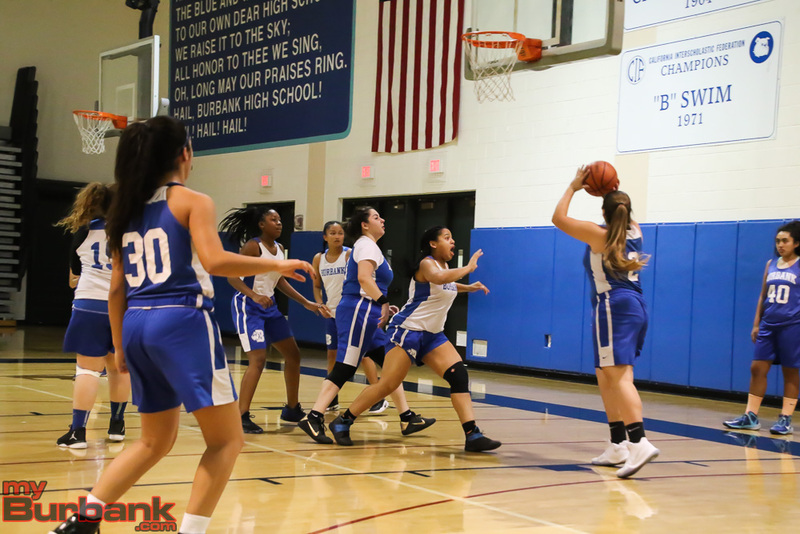 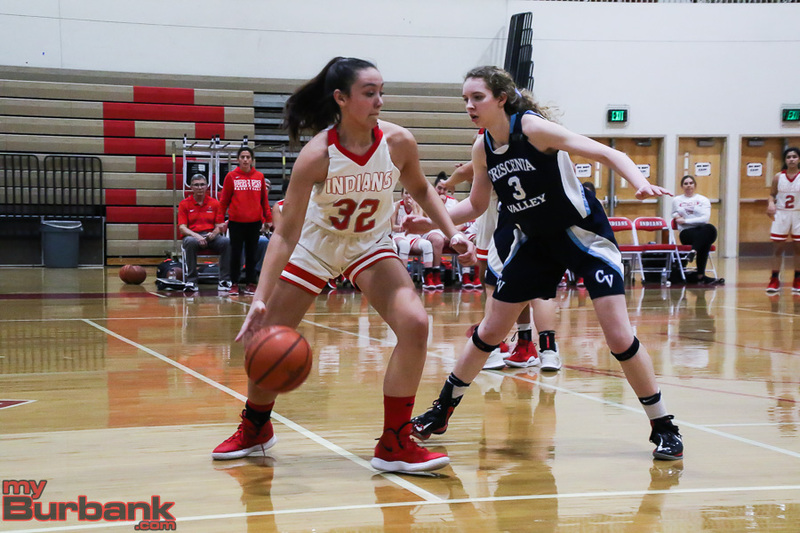 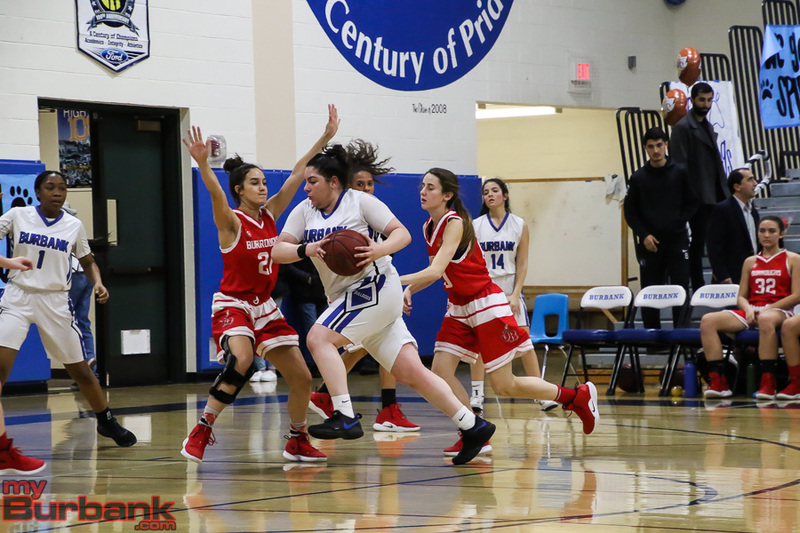 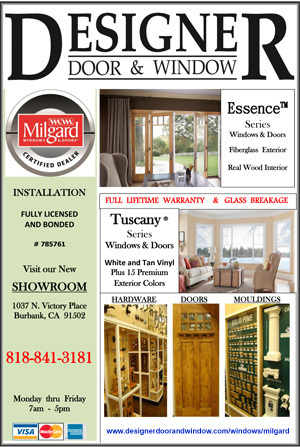 This entry was posted in Girls Basketball, Sports and tagged A'sia Morales, Ariana Farias, Burroughs Girls Basketball, Faith Boulanger, Jill Kukawski, Kayla Wrobel, Marin Grote, Nicole Rumfola on January 24, 2018 by Jim Riggio.